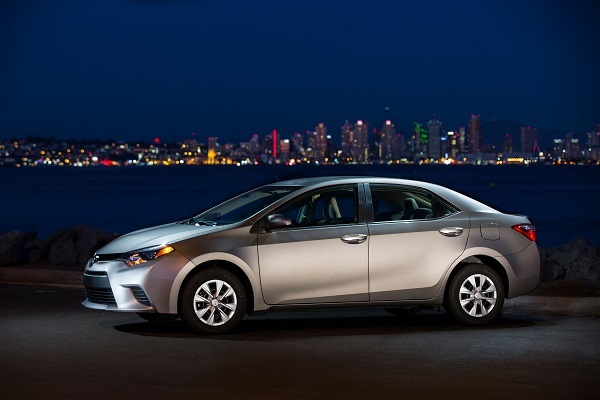 The new 2014 Toyota Corolla LE Eco will be one of the top sellers in the new Corolla line. Our quick spin in the car revealed one big surprise and confirms the worst fears of its competitors. When driving off in our 2014 Corolla LE Eco test car, which will make up the bulk of overall sales, we were stunned by the new transmission, which is, gasp(! ), a continuously variable transmission. As a car enthusiast I am supposed to hate this new “gearless” transmission, right? Not so fast. As I drove off and accelerated smartly, the car shifted. Not a subtle shift either. I could swear it shifted three times. I stopped to make it happen again and it did it. Figuring I must be mistaken about the exact Corolla I was in (the low-volume “base” model has a traditional 4-speed) I returned to the paddock. I looked at the window sticker and indeed it stated CVTi-S, meaning continuously variable transmission. Weird. Later I had a chance to speak with a Toyota employee of some stature about the new Corolla's development. From Japan, but based in New York city, he knew this car inside and out. He explained to me over cocktails that Toyota noted the press and public outcry over CVT transmissions used by Nissan and other manufacturers and decided to do something about it in their own cars. Toyota engineers built in a “shift” feel in the Corolla just for the US marketplace. They were able to do this without any sacrifice in EPA estimated fuel economy. Toyota says this car will achieve 42 MPG highway and 35 MPG combined. Those numbers are as good as it gets in terms of a gasoline fueled car this size, without any expensive hybrid equipment. Since the Corolla uses regular unleaded gas, its cost per mile for fuel will be lower than diesel Jettas, and may even be better than the Chevy Cruze diesel. We will do a careful analysis once the numbers are firmed up, but we also suspect that this car will emit less CO2 per mile than any other liquid fueled, non-hybrid car as well. Around town the 2014 Corolla does not seem underpowered. Accelerating from a stop to 50 MPH the car feels just like any other car in its class and there is no drama, no objection from the engine bay, and certainly no bad noise or vibrations. The steering is good, the handling is good, the brakes are good. If you want a car that does all of these things better Toyota has one for you. As does Lexus. Returning the car to its spot and backing in, the rear-view camera was handy. It is high quality and very useful. A friend of Torque News recently brought home a new 2013 BMW costing $ 44,000 that does not have this feature. The Corolla LE Eco has an MSRP of $ 18,300. The 2014 Toyota Corolla is going to impress any driver that is considering buying one. Before the drive the interested shopper is going to see a car that is classy, conservative, and a Toyota. If they didn’t want these things they would not be looking at one in a dealership. Upon entering the vehicle the Corolla experience continues, but the first obvious change is space. Toyota is the reigning master of getting the dash the heck out of the way. Like the Toyota RAV 4, the new Corolla moves the dash away from the driver’s right knee. This tester is 6 feet tall and inside I felt like I was in a large car. The car has so much back seat space I could adjust the front seat to my liking and then get in back behind it with about 4 inches of knee room. That makes this car bigger than the Lexus IS 350 sports sedan. In fact, this new Corolla is as large as the original Camry, and frankly, twice the car. Usable space, fit and finish, observable quality and refinement are at the level the Camry was at about 4 years ago, or one generation ago. If a new Corolla shares a family driveway with an older, say 2006 to 2011 Camry and the keys to both are available, it would not surprise this tester if the Corolla was the car taken out. Toyota is a master at this. Having grown up in a family where there was a Toyota Supra and also a 5 year newer Celica in the driveway, we can attest to the fact that the newer, less expensive Toyota is often better in overall feel. The new Corolla is not the flashiest, the sportiest, or the cheapest entrant in its class. Toyota did not intend it to be. What it is, and what shoppers will quickly see, is a great Toyota, and a car many will drive home. For a breakdown of the 2014 Corolla model trims please see our prior story. Look for a full test review for the 2014 Corolla line at Torque News in two weeks.